WATSON is my male Umbrella Cockatoo. He was imported as a baby early in 1984, but didn't come into my life until Sept of 1994. Very little of his past is known to me. He is my "Gentle Giant". In the years I've owned him he has never once shown any aggressive behavior, which is typical of the Cockatoo's loving nature. Owners frequently refer to their pets as "Love Sponges." And it's a good thing! A bird that size has incredible strength. That large beak could inflict some serious damage to flesh and bone! 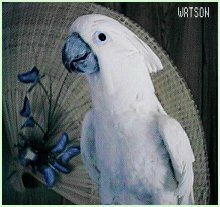 Although Cockatoos have talking abilities, Watson has never spoken one word. But that's okay... I think he's perfect just the way he is. When evening comes and I'm snuggling with my big white baby, I always think what a perfect way this is to end my day. He never bites, he doesn't make my eardrums vibrate TOO often, he doesn't feather pluck, and he returns my love unconditionally. 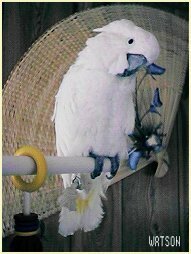 From the majestic Moluccans to the goofy Goffin's , Cockatoos have earned a reputation as wonderful pets. They are, in a word, ADORABLE! Intelligent, cuddly creatures that thrive on attention, they can develop behavioral problems like excessive screaming and/or feather plucking when the attention they have become used to is denied them. Have you ever heard a Cockatoo scream? Believe me, they can make your eardrums vibrate! A COCKATOO IS DEFINITELY NOT THE RIGHT PET BIRD FOR EVERYONE! Like most pet parrots, Cockatoos can charm us with their sweetness and beguile us with their clownish antics. They are often downright silly and can be a source of endless entertainment. In fact, it's their appealing nature and awesome beauty that often causes them to end up in the wrong home. New owners are sometimes unprepared to deal with the deafening screams that their cute, sweet pet can emit, and may eventually regret having brought the bird into their home. These behavioral problems can be corrected, but it takes a willing owner with a LOT of patience. 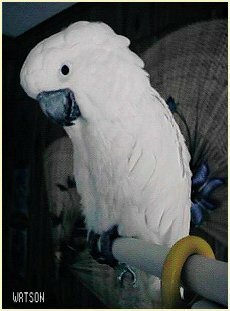 This is not said to discourage anyone from getting a pet Cockatoo- but rather to inform about potential problems that might be encountered. Keep in mind that a certain amount of screaming is NORMAL, NATURAL and HEALTHY for cockatoos. Generally, these screaming episodes occur at dawn and again at dusk. Normal screaming should not be discouraged! 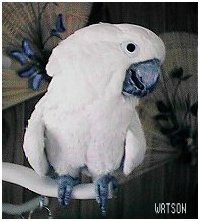 These birds have many endearing qualities- particularly their gentle, loving natures- and a devotion to their owners that is perhaps unsurpassed by any other parrot species. The large Cockatoo species can live up to 75 years with proper care and diet.